Meanderings and Reflections: That smell . . .
Today when we visited the Ulster Folk and Transport Museum, there was a section where smells from days of yore were kept in a box for us to sniff. For me it was something incredible. I had never seen something like that before. This prompted a discussion with my friends. The topic: The power of smell. My friend expressed how viewing a film in a theatre has involvement of all the senses except the smell. Well, it is true that smell is something which is not quite prominent while discussing the senses. For me it's one of the most sensuous and delicate. Smell is related to memory and nostalgia. Many a times, a whiff of a once familiar smell sends me off to a past when I experienced that particular smell. The smell of earth during/after rains always makes me feel a sense of longing. Sometimes it's only longing and it is not connected with any person or object. The smell of new books while flipping the pages for the first time is heavenly. I am a staunch smell-person, by Jove! I often wonder about the loss of this sense. I can't even imagine. I remember seeing a documentary in BBC years ago about a man who had lost his sense of smell. He was telling the audience of how his memory was totally gone. He was lamenting about not being able to smell his morning coffee, freshly baked bread and the perfume on his wife. That struck a chord within me. What would I do without smell. Amorous conversation is incomplete without the line: I love the smell of you (skin, hair, breath, clothes). I can go on and on about the smell of a beloved. It's magic. Cooking, cleaning, bathing, walking, etc -- all these activities have some sense of smell associated with them. Long ago, I saw a 2006 released French film Perfume: The story of a Murderer. It was an evocative one where the protagonist has a strong olfactory sense. He kills many women in the process of extracting their smell. I think it's a lovely film whose protagonist is not Jean-Baptiste Grenouille but the olfactory sense!! I wish you could smell the ambience of my room while reading this post but then . . .
Wow.. a place where they store smells! I have heard about it for the first time. I think its awesome. I remember reading a article on how a technology has already been developed using which you can smell related stuff.. this was when they were discussing perfume sales over the internet and how this would boost the sales. I think music is also simlar to smell in bringing one back to a memory. Yes, not being able to smell my morning coffee would be the pits. age--been my forte and mt love. I can distinguish perfume smells (by brand name) in an elevator (lift?). My father, sightless always, when he became totally deaf, took a correspondence course on how to live with this dual handicap. Lesson one was to distinguish 47 different scents during the first week, and braille them in. I'd better not get started on smelling, because you might have to reject my comment--grin! Each one of our senses, is extremely important. As for smell, you've nicely elaborated on good things associated with smell. I'll mention two bad smells: that of fish, and that of people with gum disease. Luckily, there are ways to deal with these smells. 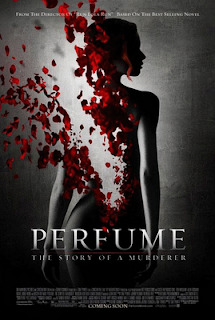 *The Perfume* was a very interesting movie indeed. Oh, dear Susan. You speak of "Perfume". That is one of my all-time favorite movies. I read the book years ago, but a few years ago when I saw there was a movie being made based on the book, I was jumping up and down inside my heart, breathless with anticipating its coming out! And needless to say, it is one of the most beautiful movies I've ever seen. Though his character is sinister, Grenouille knows no better. He is a man with an acute sense of smell who can't help himself. Even those of us with a normal sense of smell sometimes can't help ourselves. I know when I'm cooking, I keep tasting because the smell is so heavenly. I know perfume is such an important part of my daily living. I know when my husband had to go away for 6 months a couple of years ago, one day, as I was dusting our dressing table, I picked up a bottle of his cologne and dared a sniff. Silly me! Just that sniff practically put me in a coma for the rest of the day... a coma of tears and sniffles and literal ache in my heart. The memories that came with that little sniff were overwhelming, and my spirit broke from all the weight. We are all creatures of smell... some more than others. And we can't help it, can we, that nature has so many different fragrances and odors to both delight and disgust us? But whether we are happy or sad with our reactions to smell, there will always be the memories... more powerful than any other feeling! It has been a genuine pleasure sifting through your posts. Talented, profound, and absolutely authentic. --I sneeze every time someone walks by doused in perfume. My husband, then-boyfriend, gifted me an expensive Chanel perfume the first time we met...that bottle still sits unopened in my closet. --I spent a good 45 minutes selecting the most beautiful smelling candle for a new colleague -- her welcome gift -- only to find out later that the had her olfactory senses haven't worked since she was six. a place of nice smells ?? great idea that is !! you are enjoying,aren't you ! I want the smells but I can't and I know it is hell. Due to certain conditions in my nasal cavity there are periods where I can't smell-Anosmia it is called. It is also a blessing when you are walking the huge garbage bin called Chennai. ah, the sweet fragrances of life and love - to be savored to be remembered - and cherished - and then, there is the whole reality thing of allergies - and what to do - with parfums, for example! when i was visiting home recently, i stayed with one of my daughters who has severe allergies and i was unable to spritz and spray my sweetself as i am prone to do lavishly - and how i missed it!!! Sameera: Isn't that wonderful? I found that so fascinating. GQ: Music does that to me as well. I know what you mean by not being able to smell the morning coffee. Steve: Your dad is amazing. It's wonderful that he chose to do that course. And your perfume one. I am like that as well :) I can never reject your comment, can I.
DUTA: Fish and gum disease: ughhhh but then that is a rarity but it is smell nevertheless. Zuzana: I did read that post. Memories and smell are linked intricately. And we cannot live without either. Ah Nevine: How well you have described the power of smells and memories. I liked that character from Perfume. Just imagine having that kind of olfactory sense. It's mind boggling and so it is. Mohamed: Ah, you always make me happy with your words. Glad to have reader like you as well. Mansi: Wish I lived close to you so that I could grab all those unused bottles of perfumes. I am a great fan of them. Thanks for your kind words. Nu: Take all of it from here. With love of course. Govind: Oh yes. I can't smell when I have cold but is your condition different than a cold? Don't call Chennai like that. It's better than Calcutta or Bombay for that reason. Jenean: What a pity when you cannot smell as you like. Hmmm. Still here. Will be here till the 31st. Sad now as only two weeks remain. I'm totally going to check this place out when I go!! I'm big on smells too. It's one of the first things that attract me about a man and takes precedence over looks. It dooes come after language and grammar though ;) I don't remember my ex's face. But I remember his smell. Currys smell great and so does the pan after making it. Smells are a great turn-on for me as well esp the musk . . .
Glad that you stopped by. Shall look out for you by and by.